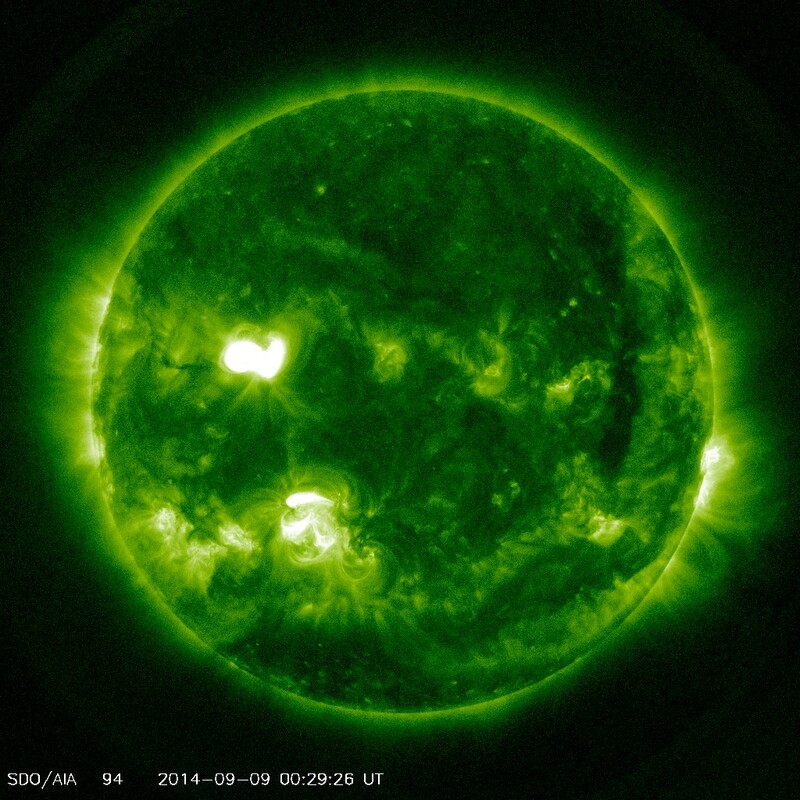 A long duration solar flare measuring M4.5 was observed around region 2158 peaking at 00:29 UTC on September 9, 2014. 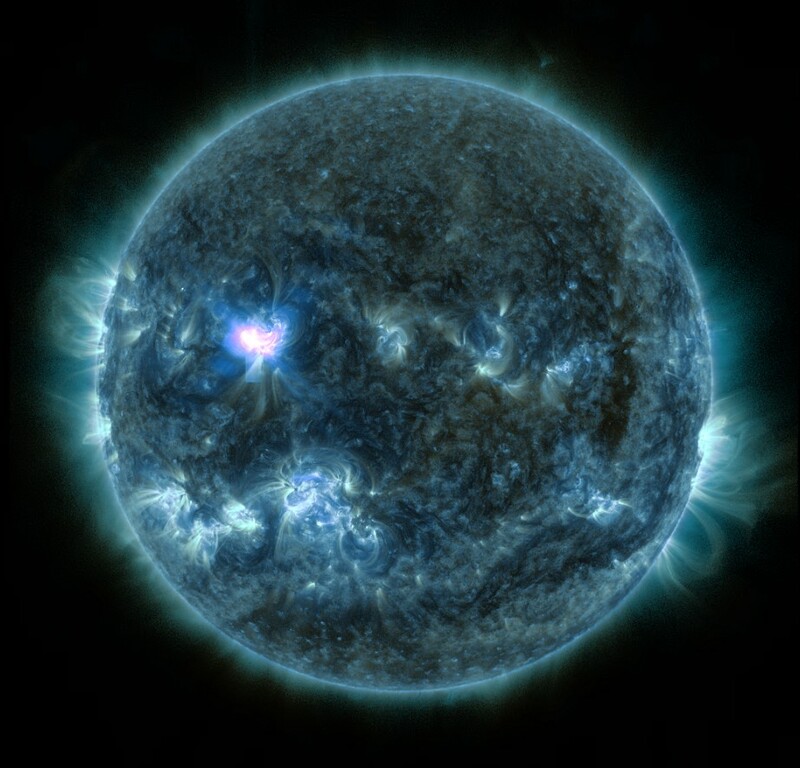 The event was associated with Type II and IV radio emissions, and a Ten Flare lasting 10 minutes and measuring 370 solar flux units. A coronal mass ejection (CME) became visible soon after in LASCO C2 imagery and while most of the plasma looks to be headed to the northeast, there does appear to be a weaker Earth directed component. A prediction model released by the Goddard Space Flight Center is calling for a glancing blow impact by late September 11 or early September 12. 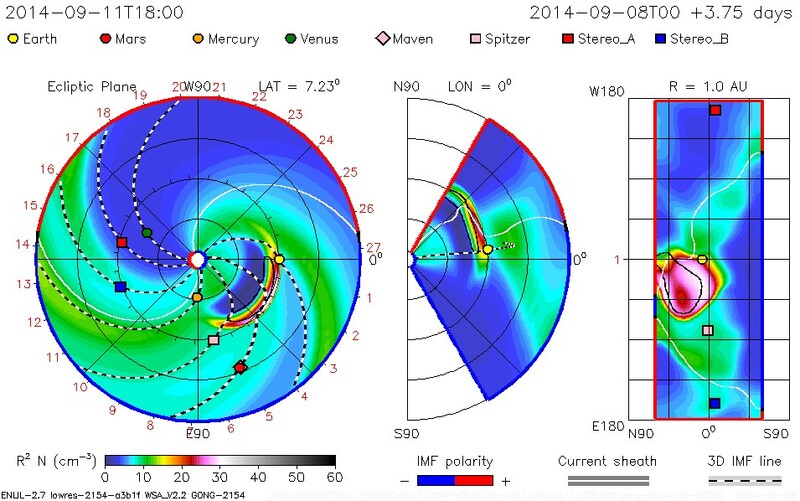 NOAA/SWPC issued a watch for at least minor geomagnetic storming (G1) beginning on Sept. 12. 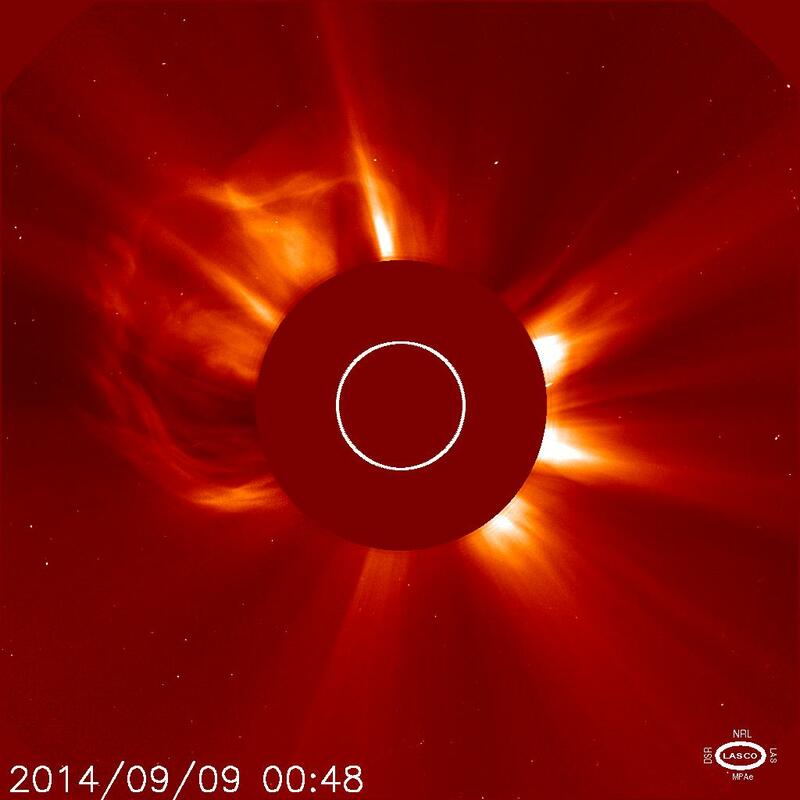 CME from this event swept past Earth at 23:46 UTC / Sept 11. Minor geomagnetic storming was observed at high latitudes. G2 Storm watch issued by NOAA/SWPC beginning early on Sept. 12. Geomagnetic conditions will of course depend on the strength of the actual incoming shock impact, followed by solar wind characteristics (Bz/IMF) in the hours following any such impact. More to follow in the days ahead. 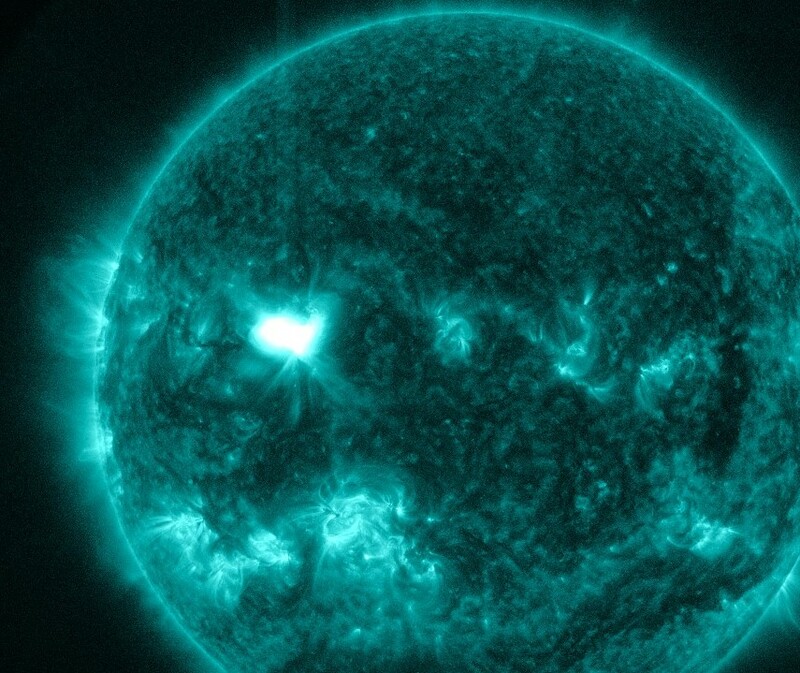 Aurora - Aurora may be seen as low as New York to Wisconsin to Washington state..
A prediction model released by the Goddard Space Flight Center is calling for a glancing blow impact by September 11. A minor increase in geomagnetic activity will be possible at high latitudes. Here is a closer look at the coronal mass ejection (CME) from last night following the M4.5 solar flare. 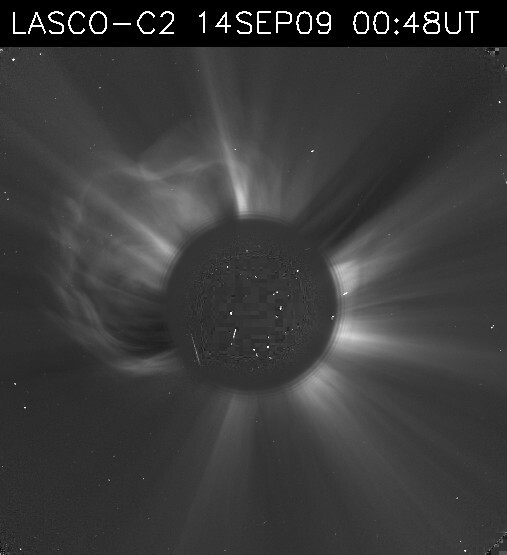 Based on complete coronagraph imagery from LASCO C2 and C3, the expanding plasma cloud was directed mostly to the north and east, but also contains what appears to be a fainter Earth directed component. The Earth directed component is more evident when viewing in the wider angle C3 view. 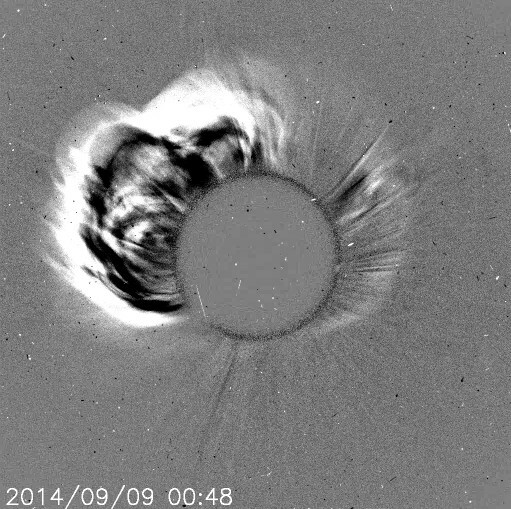 It is possible that we could see a glancing blow to our geomagnetic field within 48-72 hours from this CME. More updates regarding this event once an updated tracking model becomes available. Click image below to view a video. 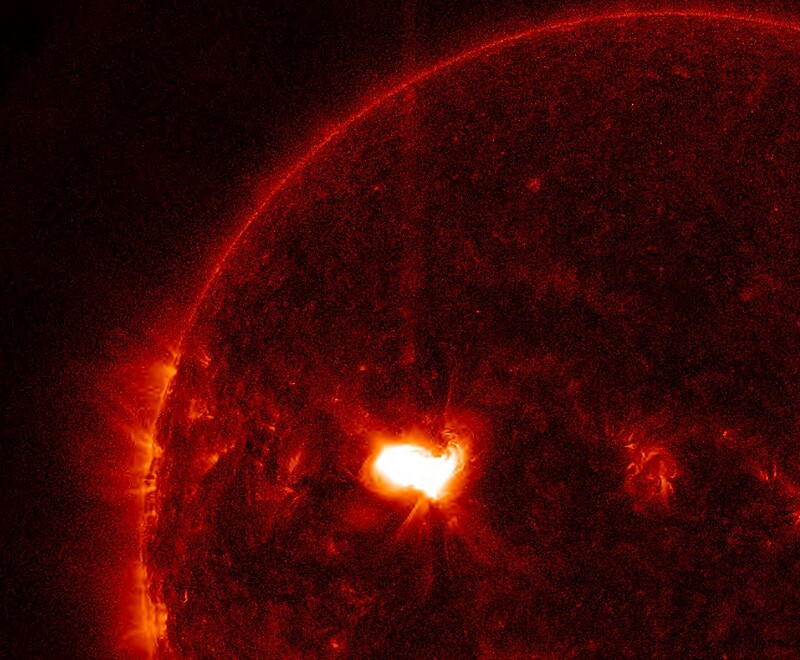 Video of the M4.5 solar flare by the Solar Dynamics Observatory (SDO) is now uploaded. AIA video of the event is now available. Located to the right. 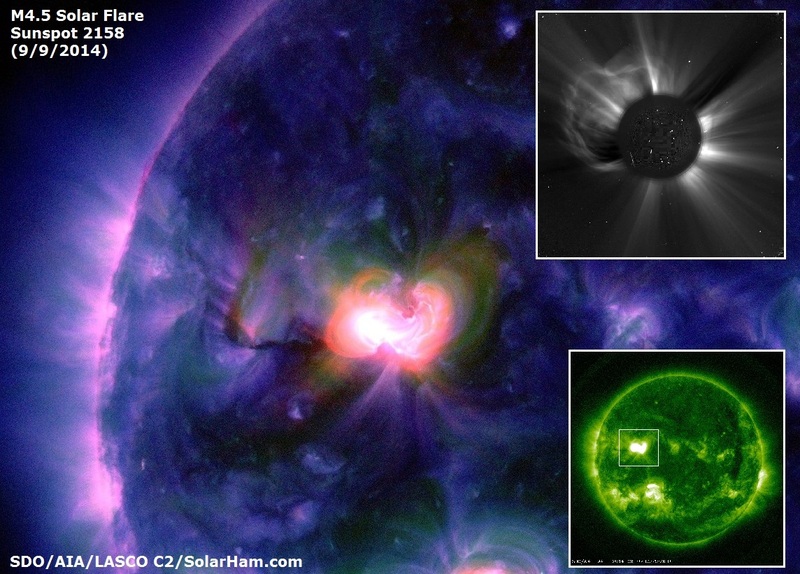 New coronagraph imagery reveals that a majority of the plasma is directed northeast, however there does appears to be an Earth directed component. More to follow. Region 2158 produced a long duration M4.5 solar flare this evening peaking at 00:29 UTC UTC. 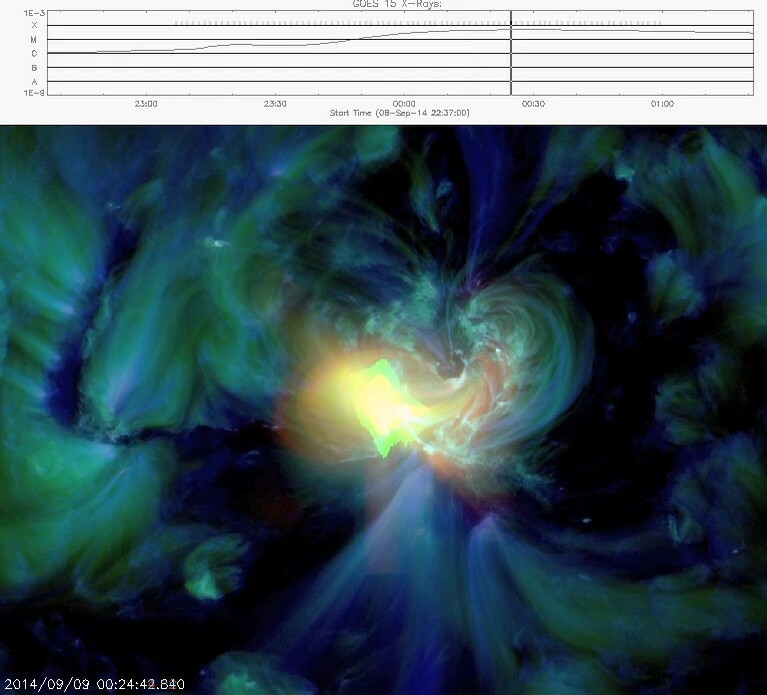 The event was associated with Type II and Type IV radio emissions, along with a 10cm Radio Burst (Ten Flare) measuring 370 solar flux units and lasting 10 minutes. 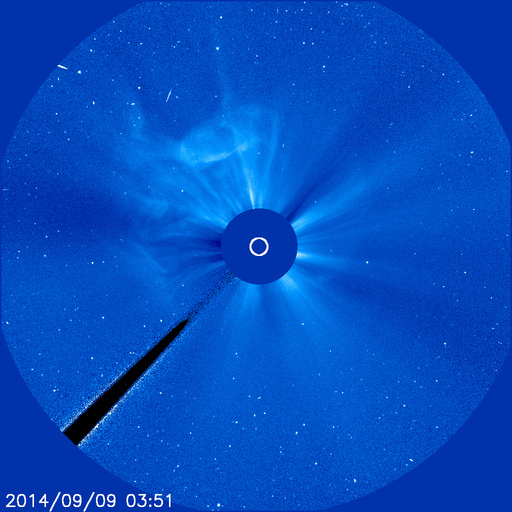 A coronal mass ejection (CME) is now visible in the latest LASCO C2 imagery. More details to follow regarding a possible Earth directed component.